CricketTalk: Gary Ballance the ‘chosen one’ at Yorkshire | Can England salvage pride in Chennai? LEADING THE WAY: Gary Ballance is Yorkshire's new first-team captain. GARY BALLANCE has been chosen as the man to succeed Andrew Gale as captain of Yorkshire, the former skipper himself succeeding Jason Gillespie as first-team coach only last month. The 27-year-old left-hander - who has endured a difficult tour of India after being dropped from the Test line-up after struggling in Bangladesh - will be in control on the field across all three formats in 2017 for Yorkshire. The Yorkshire Post’s cricket writer Chris Waters joins host Phil Harrison to discuss the appointment and why Yorkshire have pursued this option since Gale’s move ‘upstairs’. We also discuss the forthcoming fifth TYest match for England in Chennai against India and what has gone so wrong on the current tour which leaves Alastair Cook’s team 3-0 down going into the fifth and final encounter with Virat Kohli’s men before they head home for Christmas. 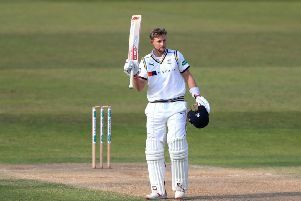 Is there a way back in for Yorkshire’s new captain to prove he can still cut it international level and what ar England’s middle-order options going forward. We also discuss how long Cook will continue as England captain, with the five-day team not in action again until July next year when South Africa visit England.